The Liturgy Committee, an instrument of the Spiritual Formation Program, functions under the supervision of the Faculty Liturgy Moderator. The Director of Music is a member as are other faculty members whom the Rector appoints in consultation with the Faculty Liturgy Moderator. The student members are the Liturgy Coordinators, the Masters of Ceremonies, the Head Sacristan, and any other students whom the Rector appoints in consultation with the Faculty Liturgy Moderator. The Spiritual Director or his appointed representative shall serve as a liaison with the Spiritual Life Committee. 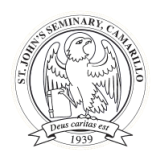 The committee concerns itself with the liturgical life of the seminary, including the Eucharist, the Liturgy of the hours, the Liturgical Year, and other liturgical observances such as the Advent Clergy Service. The Music subcommittee functions under the supervision of the Liturgy Committee. The Music Director is chair of the Music Subcommittee. The student members of the subcommittee are appointed by the Director of Students in consultation with The Music Director. Faculty members may also serve on this subcommittee in the day-to-day organization of the liturgical musical life of the community. assist the Director of Music in the maintenance and supervision of materials and equipment in the music department, preparing the annual music budget, and any other relevant tasks assigned by the Director of Music.